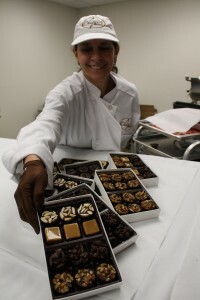 Chiqui’s Chocolates started in 2002 by accident. My daughter came from South America to Minnesota for a short visit and had a very specific craving: to eat some turtles made by a local candy shop. The shop was closed for a few weeks, so after seeing her disappointment, I remembered I had a very old recipe for caramel. We went to buy all the ingredients and started a process which we believed was going to be very simple. After following the recipe, our final product tasted very good, but the texture was not quite right. We loved the taste and actually believed it was better than the one in the turtles my daughter had been craving for from the candy shop. So, after she left, I began to make this caramel every single day for over 8 months, sending samples to everyone I knew around the country and asking for feedback. Then I started to receive orders from friends and family who wanted to give my chocolates to their friends and relatives. Today, Chiqui’s Chocolates continues to grow and will continue to grow thanks to all who try them and keep coming back for more. Thank you, because without you, we would not be where we are now.